I have a golden greek and the place I got it told me to keep it dry. I am using walnut shells as substrate and a small part of aspen but the shell is not growing smooth and nice..it seems dry. Should I add moisture in a section of the closer. The diet is fine I give it spring lettuce and dandelions with a sprinkle of calcium. It is about 10 months but is only 2 inches , is this small? What can I do about the shell? Here are a coupld of link to some really good information. If uyou can't click it, just copy and paste it into your browsers address bar. Do NOT make the substrate wet. But do give the tortoise a place to soak. If your are getting pyramiding on the shell, the animal isn't getting enough calcium. Since you are giving calcium, check the amount of UVB light you provide. 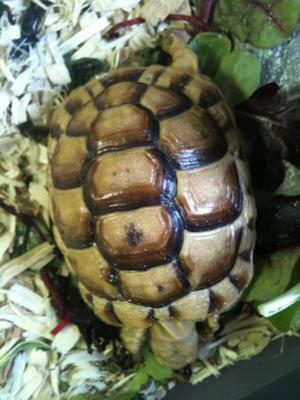 A tortoise can't metabolize calcium wihtout UVB.